Latvian brooches There are 3 products. 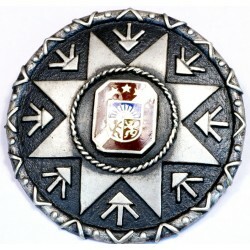 Brooche with the Latvian national symbols in the centerpiece. 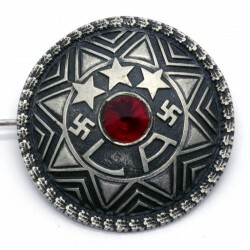 Brooche made in the Latvian Ethnic style. Dimensions – round, diameter apprx. 40 mm. Material – silver 925 . The pictures are from actual item that you will recieve. Latvian Brooch "Saulīt tecēj tecēdama"
Latvian Brooch "Saulīt tecēj tecēdama" in a damaged condition without pin. Circa 20 - 30ies of 20th centure.Consistent with its age, Please see scans! 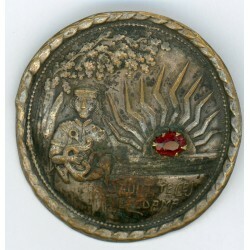 Title – "Saulit tecej tecedama" Dimensions – round, diameter apprx. 47 mm. Material – silver gilted brass. The pictures are from actual item that you will recieve. Brooche with the Latvian national symbols in the centerpiece. Brooche made in the Latvian Ethnic style. Dimensions – round, diameter apprx. 39.20 mm. Material – silver 925 . The pictures are from actual item that you will recieve.